We all know the story of Orson Welles' 1938 radio broadcast of The War of the Worlds which, with its convincing simulated news bulletins, spread mass panic across the US leaving millions believing that America was being invaded by aliens. Right? Actually, no. It turns out that the stories of panic were greatly exaggerated. Some people were spooked, not realising that what they were hearing was a fiction, but the streets were not filled with hysterical people convinced a Martian invasion had begun. Welles' clever, updated adaptation of HG Wells' 19th century sci-fi novel not only used fake news reports for dramatic effect but itself became—to some degree—the subject of fake news. Who did the spinning? Welles himself? Or the newspapers nervous about this new-fangled thing called radio, a medium which was to prove such a useful tool in the looming propaganda wars of WW2? This, and more, is examined in Rhum and Clay's super-smart, multi-layered new show, War of the Worlds, at the New Diorama. Even the title both tells the truth but also slyly misleads. Because what is under scrutiny here is not just the broadcast and the myths surrounding it, but also the current info wars on the internet. 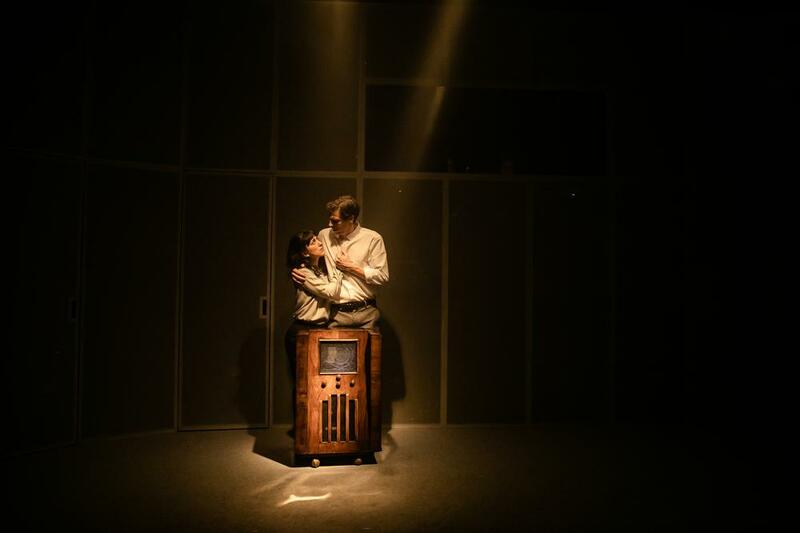 Tightly scripted by Isley Lynn (who wrote the excellent Skin a Cat) and devised by the company—Mona Goodwin, Julian Spooner, Amalia Vitale and Matthew Wells—it's played out on a nifty set, designed by Bethany Wells, which recreates a 1930s American radio studio. It also elegantly serves as Grovers Mill, the real New Jersey town, which was used in Welles' version of The War of the Worlds as the initial location of the alien landing. There is some very effective lighting from Nick Flinoff and Pete Maxey which almost persuades you that aliens have landed. Grovers Mill has since created a cottage industry based on its connection to an alien invasion which never happened, and in Rhum and Clay's time hopping show, it is where we find Mina, a would-be podcaster. 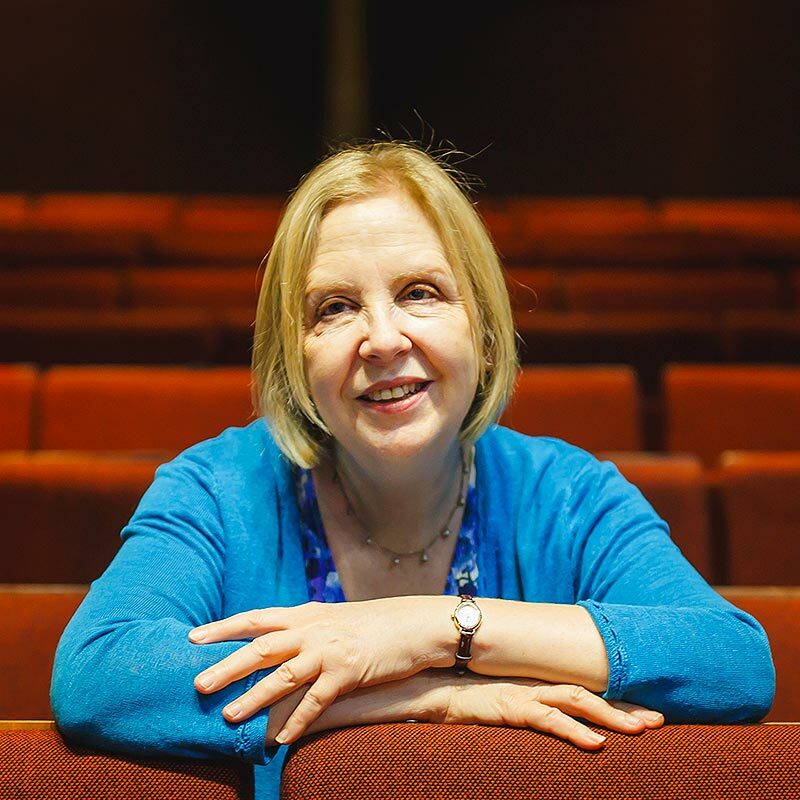 In the run-up to the election of Trump as president she has come to Grovers Mill to find out the truth about a woman called Margaret who became estranged from her American family and fled to the UK. There is a lot going on in 80 gripping minutes in which there are no less than four Orson Welles, and which constantly questions not just the nature of the truth but how some find the means to exploit it for personal or financial gain. Not to mention, how everyone is committed to their own particular version of the truth. That is very much the case within families where one person's truth is another's myth. 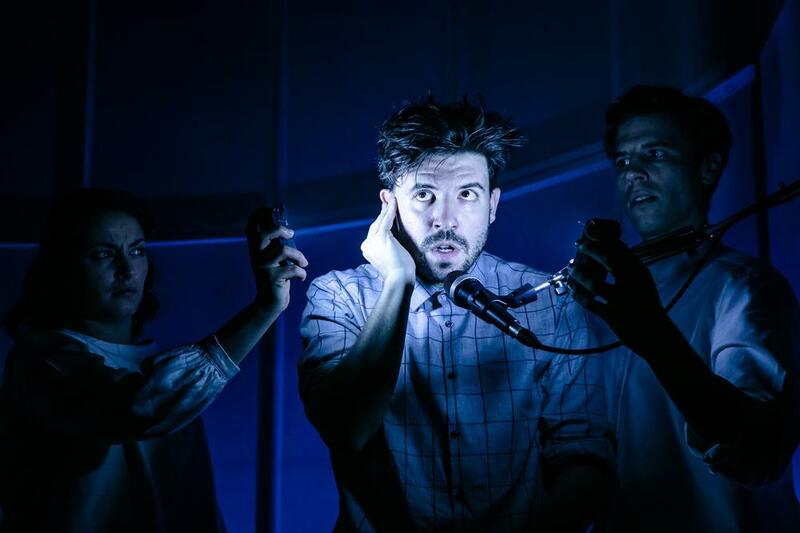 Last summer in Edinburgh this Lecoq trained company re-imagined Dario Fo's Bible-stories inspired Mistero Buffero to examine the dangers of populist Messiahs. Prior to that, the company produced the superb 64 Squares about the unreliability of the narratives we spin. The addition of this show makes it look as if a substantial body of work is emerging. The evening delivers plenty of theatrical punches and plays lightly on the idea of theatre as a lie as it reminds how truth depends on who is telling it and why, how new technologies change the game, and how susceptible we remain to manipulation, particularly at times when the world seems an uncertain and frightening place. Tip: if you like the sound of the company behind this show, you can follow Rhum & Clay on the Stagedoor app. The next time they have a show on in London, Stagedoor will let you know.